Can you confirm these amateur observations of Trilepida brasiliensis? Types Holotype: IRSNB Reg. 2049. I.G. 12594. Diagnosis Diagnosis.Distinguishable from all congeners by the following combination of characters: snout slightly rounded in dorsal and ventral views, obtuse-rounded in lateral view; supraoculars absent; supralabials generally 2+1, rarely 1+1; occipital scale usually extending ventrally beyond the level of last supralabial (posterior to the ocular shield); ocular shield subhexagonal with anterior border rounded at eye level; rostral subtriangular in dorsal view; middorsal scales 194–224 in females and 193–209 in males; midventral scales 178–212 in females and 171–196 in males; subcaudal scales 13–19 in females and 17–20 in males; fused caudals present (Fig. 1A); temporal scales distinct; ten scales around the middle of the tail; dorsum uniformly light to dark brown, covering five or seven dorsal scales, contrasting with whitish-cream color covering seven or nine scale rows on the belly [PINTO & CURCIO 2011]. 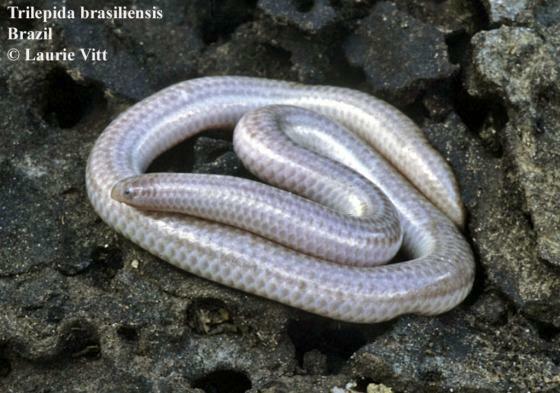 Comment CORDEIRO & HOGE (1974) misidentified a specimen of L. borapeliotes as L. brasiliensis (fide CURCIO et al. 2003). Taxonomy: the presence of two supralabials, as mentioned in the original description of S. brasiliensis, is not a common feature for this species, occurring at low frequencies throughout its geographic distribution. Based on a diagnosis presented in a recently published paper, as well as on additional external traits and on hemipenial characters, Pinto & Curcio (2011) recognize Siagonodon brasiliensis as a species of the genus Tricheilostoma.